Click the button below to start your 1-Month Free trial. You won't be charged now. 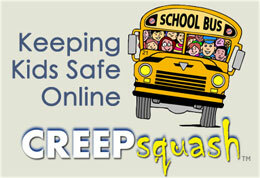 If you wish to continue using CreepSquash protection after your first month, do nothing. Your CreepSquash membership will automatically continue and your Paypal account or Charge card on file will renew each month at the standard rate for the plan you selected ($6.99 or $8.99). You may cancel membership at anytime with no further obligation. Free Trial is limited to new members only. One account per household.